Process coconut and oil in a food processory until very finely ground. In a medium bowl, sift together bread flour, cake flour, baking soda, baking powder and salt. In a large mixing bowl, using a mixer on medium speed, beat together ground coconut and sugar until well combined. Beat in vanilla and eggs until combined - about 2 minutes. Reduce mixer speed to low and beat in flour mixture until just combined. Stir in white chocolate chips and oats until well combined. Chill dough in refrigerator or freezer for 20 minutes or until firm. Using a cookie scoop, place scoops of dough onto cookie sheets. Bake 12 minutes or until light golden brown. Cool 1 minute before transferring cookies to wire racks to cool. 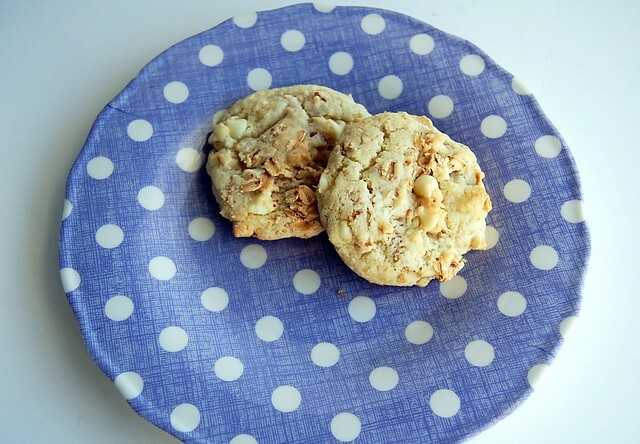 36 comments on "Coconut White Chocolate Oatmeal Chippers"
Pilates is so much fun, though I think I like zumba even better. That's great that you're loving all the classes. 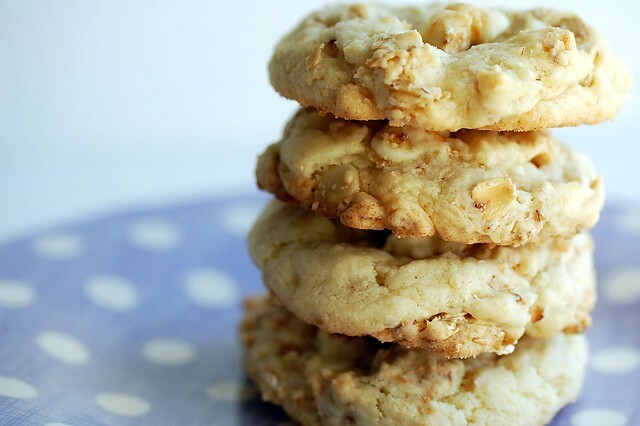 These cookies look like a delicious way to reward yourself after hitting the gym. I can just picture macademia nuts in those cookies. They look wonderful Emily. I am going to give them a try soon (another one on the list of tooo many recipes I want to make!). Oooh we adore this combination! 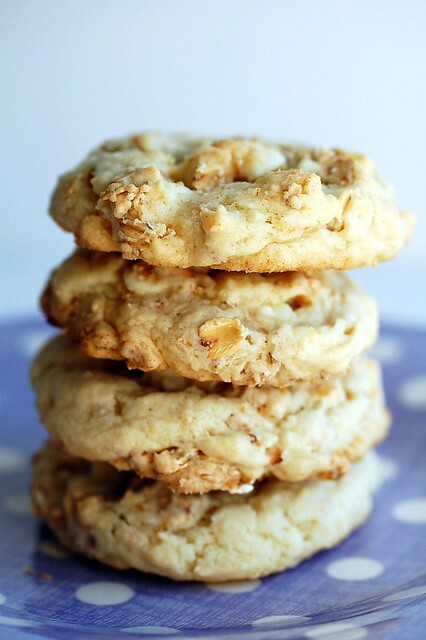 Coconut, white chocolate and oatmeal? Sounds soooo yum! i love white choc and any recipe with it has my name all over it! Those cookies look ridiculously good and you used some of my favorite ingredients. I can't wait to try them! oh, if i got a hold of these cookies, i would need everyone of those exercise classses! i know i could eat a bunch of these chippers!!! i love zumba, but I definitely miss about every other step :) it's funny, to say the least. I'm pretty sure I look like a total doofus in zumba. Or a rabid animal. But I love it so much that I do it anyway. And I swear that after the first few classes you WILL get the hang of it! Oh these cookies. In love. You had me at coconut. And white chocolate. And cookies. The more I think about it, calling them chippers is really growing on me!! I am now putting coconut in everything I make (desserts, dinners, smoothies, breakfast!) and can't get enough of it. Those chippers look amazing! Can't wait to try them! Can't wait for Top Chef tonight. I'm rooting for Richard too. How did you like Pilates? I started taking zumba a few months ago and I love it. 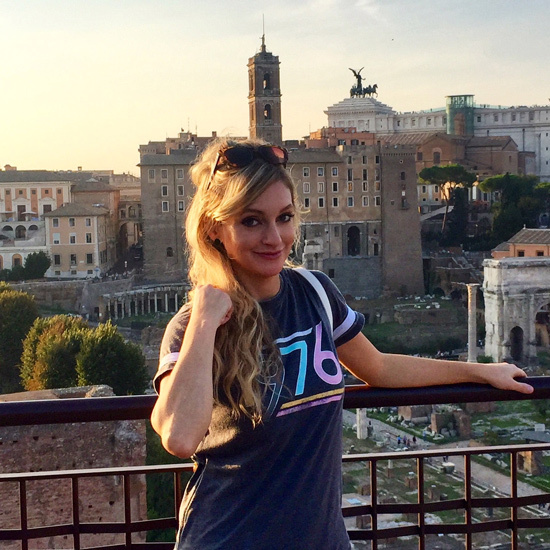 It was a struggle at first, but once I got the steps down...so fun. I bought some of those zumba shoe bands on etsy to make it a little easier. these look amazing...but why the cake/bread flour? would ap work? i still can't get over your choc chip cookies...i actually hate making any other kind! lol :) maybe these will change my mind. p.s. i love the word chippers. fun! I got a bag of white chocolate chips on the clearance rack this week. These look great. I love coconut anything. Yum. These cookies looks pretty good to me... Personnaly, I'm more into the spinnig, I like to sweat a lot! Yup...you have hit a winner. Do you adapt your recipes from anywhere or do you just throw them together yourself? Just curious. Thanks. Hey, if you were all thinking about participating in my virtual Bake for Hope bake sale (which you probably haven't, because it has yet to make a very public debut - soon enough!) I would be happy to request these! Coconut and white chocolate go so well together! You're killing me! Loving loving loving these cookies. Coconut and white chocolate are always a delicious combination. no butter needed? count me in! All things yummmy, I overslept and missed the class. Haha. Whoops. I think I need to try zumba again..
Jenna, I've been experimenting with the cake/bread flour combo in cookies, and I really like it! The texture seems better... more chewy. Malebaker, I throw them together myself. If I adapt the recipe from somewhere else, I'll mention it. Cara, I'll have to check that out! 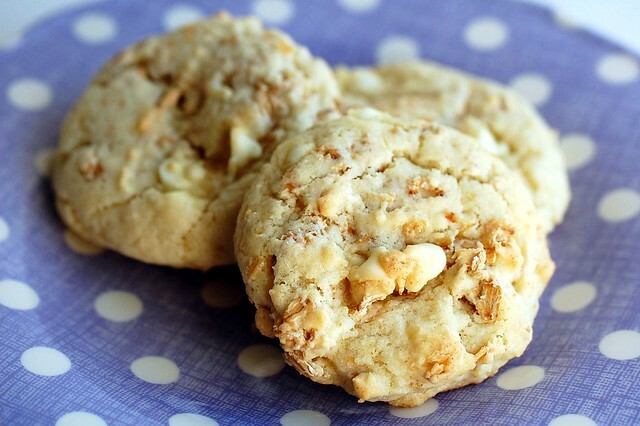 Coconut and white chocolate with toasted oats- that sounds like a killer combination! On my way to give these a try! Thanks for sharing! Mmmm I LOVE white chocolate in cookies! I could eat a lot of those right now :). Since you said I MUST bake them... I shall! They looks wonderful!!! The cookies look delicious! I normally don't make cookies other than bar cookies (because I don't like waiting to bake pan after pan), but I will try them. As a former aerobics instructor, I really like that you're trying all the classes your gym has to offer. My advice is to hang in there for step. Spinning is a good workout, but you also need something that's a little bit more load-bearing, and a well-taught step class will just about give you the best cardio/lower body workout you can get. I love anything that has anything to do with white chocolate and coconut. I love the idea of toasting the oats. I'm almost out of flour...but I WILL be making these soon. Those look like they could become my next favorite cookie. I've just been hearing about zumba. I thought everyone loved it. You probably will love pilates. It'll make you feel taller. I am very excited to make these this weekend. Keep up your wonderful posts. You are an inspiration in the kitchen and a job to read every week! Mmm, these sound completely addicting! Hello-I just made these cookies and the taste is wonderful; however they did not flatten out really-they were somewhat puffy. Any idea what I did wrong? I followed each step-even beat the eggs for about two min-seems like maybe to much mixing of the eggs that made these puffy?